Trying to talk your way out of criminal charges is one of the biggest mistakes you can make. If you are in police custody, use your 5th Amendment Constitutional Right to remain silent and request an attorney. It goes without saying that you should not make an official verbal or written statement without an attorney present. But many people do not know that, even if you have not been read your Miranda Rights yet, what you say at anytime can harm your defense later on. It is surprising how many people charged with a crime openly discuss their case in jail with other inmates on their pod or over the phone. Before trial, an inmate’s recorded call records may be reviewed, so it is not wise to discuss your case with anyone besides your attorney. While it may seem like a good idea to prove your innocence on the witness stand, your defense attorney will advise against it. There are many things that come into play when a defendant testifies, including how the jury may view your testimony and the risk that you may unknowingly commit perjury. Your defense team will advise you during the course of the trial, and an experienced attorney will almost always build a case without a defendant’s testimony. Unless you are an attorney yourself, it is not advisable to conduct your own legal research to present at trial or attempt to represent yourself. Instead, hire an experienced criminal defense attorney with the skill, specialized knowledge and instinct to build your best possible legal defense. You may be tempted to hire the law firm with the lowest advertised price, but this would be a mistake. A competent defense attorney will not offer his or her expertise at the lowest price. Or even worse, you may come across someone that will nickel & dime you and your family throughout the course of your case. If you are facing criminal charges in Utah, it is vital it is to contact a qualified, criminal defense attorney to safeguard your legal rights, establish an aggressive defense and help you avoid making costly mistakes you through your trial. 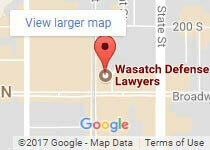 The caring and compassionate legal team at Wasatch Defense Lawyers will work with you and your family to answer questions and keep you informed during this difficult time. Contact us for your free, no-obligation case review today at 801-845-3509. We offer payment plans and military discounts.